I've been busy preparing for the holidays. I like to have everything done by Thanksgiving so I can just enjoy my family and bask in the spirit of Christmas. So I'm about 75% done Christmas shopping at this point and my Christmas cards are ordered. I'm working on a fun Christmas project (that I will post once it's done). But when I get busy and I'm on my computer for a lot of the time our kitchen gets a little lonely. These are the days when we eat cereal or ramen noodles for dinner and there are literally no treats in the house. Sad, sad. So, I like to whip up this amazing caramel popcorn, that literally takes 5 minutes. 5 minutes!!! 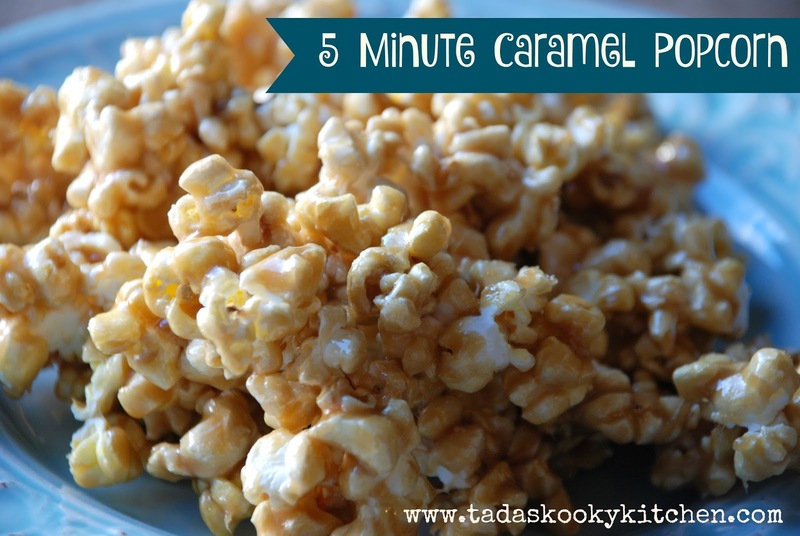 Now who doesn't have 5 minutes to make a yummy little treat? Prepare microwave popcorn as directed, then set aside in a bowl. Combine, sugar, corn syrup, butter, and water in a medium saucepan. Cook on a high heat stirring till butter is melted. Once it reaches boiling, let it boil for 1 minute more. Remove from heat, stir in baking soda and vanilla. Then pour immediately over your popped corn. Stir till coated, then spread it out on a buttered cookie sheet. Let cool a little bit (though it's hard to resist eating it right away). Then enjoy!! I got this recipe from a friend while swimming at her house last summer. She wasn't sure where the original recipe came from. As always, just trying to give credit, where credit is due.